Chickpeas have never been one of my favorites. We grew up calling them garbanzos, and eating them regularly, usually stewed in a tomato-based sauce and served along rice and some kind of meat, as is common in Puerto Rican cuisine. We always had bags of them in the pantry, and when I was really little, my mom once sat down with me to create little chickpea dolls. If you've ever looked at a dried chickpea, you'll notice that it kind of looks like it has a little nose; we used markers to draw in the rest of the little faces, and then created a dollhouse out of a shoebox for them to live in. I was obsessed with miniatures when I was little (still am, actually. I freak out about anything tiny), so naturally this was right up my alley. But once I grew up and moved out, chickpeas pretty much fell out of my culinary repertoire. I preferred black beans, which I ate heavily spiced in soup form, and never felt the need to branch out. I ignored them at salad bars and on restaurant menus, and only purchased them when I wanted to make hummus or the occasional salad (like this one, which Eugene loves). This all changed a few months ago when I ordered a side of hummus with my lunch and it came topped with a handful of crisp chickpeas. They were awesome and addictive, and I found myself craving them. I still had a few cans of chickpeas in my pantry, so I pulled one out and started experimenting. 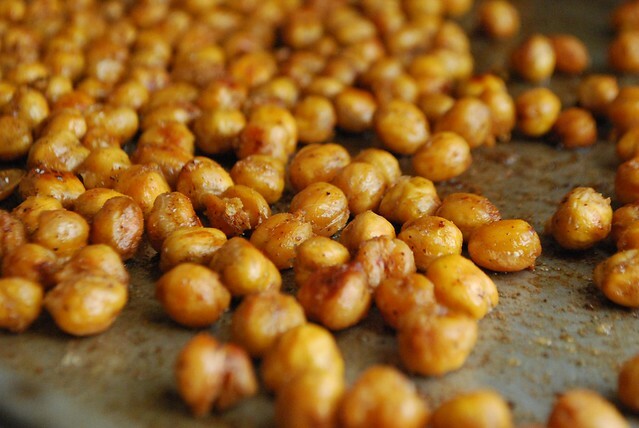 The key to crisp chickpeas is to make sure they're really dry before they go in the oven. To do this, I rinsed and drained my canned chickpeas several times, and then spread them out on a towel-lined cookie sheet. I left them on the counter for an hour to remove as much moisture as possible, then roast until crisp before tossing with olive oil and seasonings. 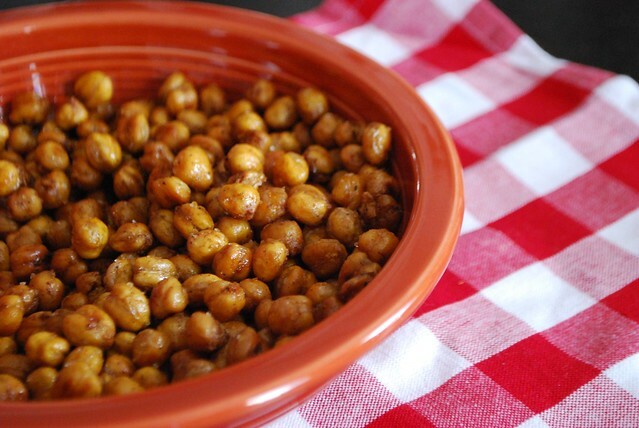 Dry roasting is really the trick behind super crisp chickpeas; if you season before roasting, the oil will keep them moist and protect them from the heat. I find that these are best served hot, right out of the oven. The combination of smoked paprika, cayenne, and salt adds smoke and heat, making for a totally addictive (and high protein!) snack. They also make an awesome garnish for hummus, salads, and soup (think of them as a healthy crouton!). If you have leftovers, you can wait until they cool completely, then pop into a zipped baggie to snack on at work or while out and about. Line a second baking sheet with a clean kitchen towel or several layers of paper towel. Pour both cans of chickpeas into a meshed strainer or colander and rinse well under cold running water. 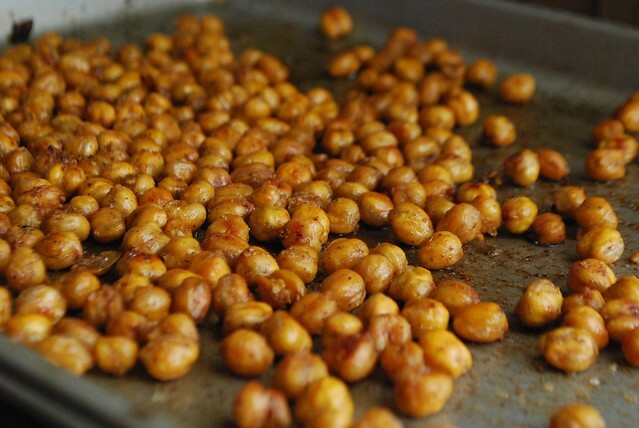 Let drain for 5 minutes in the strainer, then dump chickpeas onto the towel-lined baking sheet and spread out evenly. Leave to dry on the counter for one hour. 30 minutes before roasting, preheat your oven to 425 degrees. Place the chickpeas on the parchment lined baking sheet and roast for approximately 30 to 40 minutes, shaking the pan every 10 minutes to stir them up so that they all cook evenly. When ready, they'll be crisp, golden, and have shrunken slightly. Once crisp, remove from the oven and drizzle with olive oil (about 1 to 2 tablespoons), sprinkle on the spice and season with Kosher salt. Toss to coat evenly and serve.